The human foot is as distinctive and as complex as the human hand (D’Août et al. 2010). The foot, or Pes, forms the distal terminus of the leg. It helps to perform the two basic important functions of shock absorption and propulsion during bipedal locomotion, both of which require a high degree of stability. The foot bones are the serial homologs of the hand bones an each foot individually is comprised of 26 individual skeletal elements as opposed to the hand’s 27 individual skeletal elements, indicative of the differing evolutionary roles of both limbs with the digits undergoing reduction and modification in mammals (White & Folkens 2005: 225). As White & Folkens (2005: 292) note, the ‘human foot has changed dramatically during its evolution from a grasping organ to a structure adapted to bipedal locomotion’, where ‘mobility, flexibility and grasping ability has been lost’. As humans are bipedal walkers the feet must take the full weight of the body during locomotion and this is reflected in hard and soft tissue anatomy (D’Août et al. 2008, D’Août et al. 2010, Gosling et al. 2008, Jarmey 2003). The diagram below demonstrates the robust and compact nature of the pes elements. The human foot, highlighting the articulated individual skeletal elements in dorsal and lateral view. 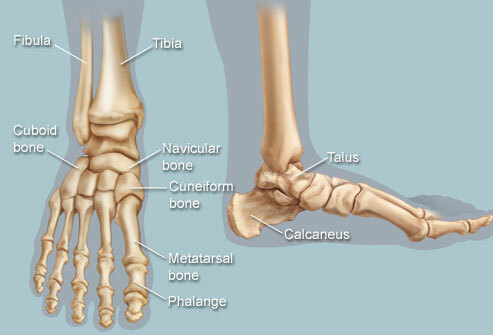 Note the arch of the foot, the size of the calcaneus and general robusticity of the bones in comparison to the hand bones (Image credit: WebMD 2013). The excavation of the human skeleton should, where possible, be conducted with patience and great care for the recovery of all skeletal material possible (Brothwell 1981). The elements that make up the foot, a total of 26 individual bones altogether (see below), are sturdy and largely compact bones, although it is likely that there will not be complete recovery of the distal phalanges due to their smaller size. In supine and crouched burials the foot bones are likely to survive, although care must be taken when excavating at an unknown burial depth (Larsen 1997). In cremation remains of individuals from archaeological sites it is still possible for certain elements to be recognised and described, especially in the case of the compact tarsal bones (Mays 1999). 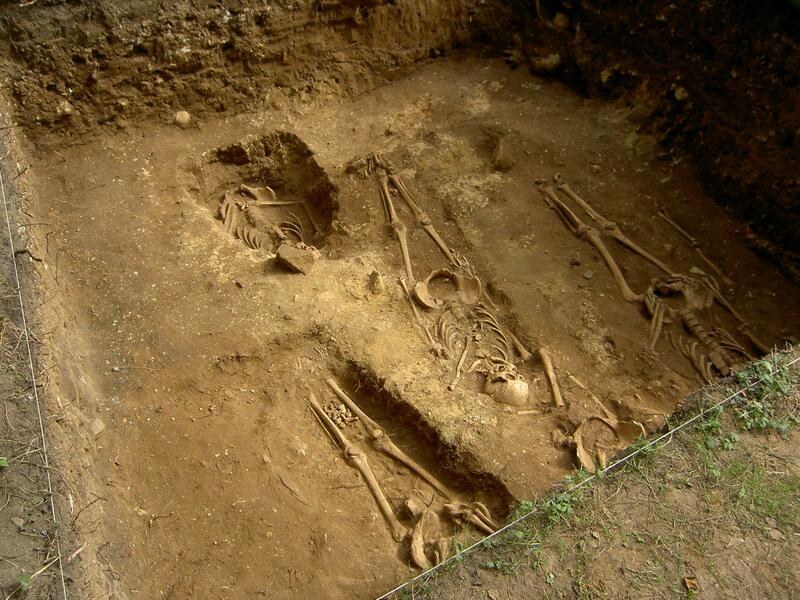 In crowded burial grounds where the body is laid out in a supine position (lying flat on the back), as n the photograph below, burials often intersect each other, cutting off the lower part of the legs (Mays 1999). This is a common feature in crowded burial grounds, and care must be taken when excavating and assigning individual skeletal elements to specific individual skeleton’s (Brothwell 1981). A photograph of a Medieval burial ground near Brodsworth, Yorkshire, UK, from the 2007 excavation. Note the orientation and sequential laying of supine burials, and how the lower portion of the legs have been covered or destroyed by other burials. Courtesy of the University of Hull and the Brodsworth project. There are 26 bones in the human foot which are grouped into 7 tarsals, 5 metatarsals and 14 phalanges, for a total of 33 joints, of which 20 are actively articulated (See image below for skeletal elements in articulation, and Gosling et al. 2008, Mays 1999, White & Folkens 2005, for further reference). 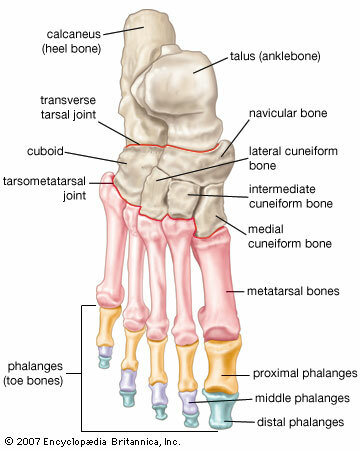 The main joints of the foot itself include the transverse tarsal joint and tarsometatarsal joint (see figure below). The talocrural (ankle) joint, the articulation between the leg and the foot, forms an important part of the stability of the foot, one of the main differences behind the pes and the manus (the wrist is extremely movable and flexible in comparison to the ankle). Unlike the hand the foot cannot grasp and is not capable of fine motor movement, however the adipose tissue and plantar fascia (or aponeurosis) is tightly packed underneath the heel (calcaneus bone) for shock absorption during locomotion (Gosling et al. 2008: 304). The stability of the ankle joint is strengthened by the wedge shaped articulation of the talus and calcaneus bones and by the strong collateral ligaments helping to tightly pack the anatomy during movement (Gosling et al. 2008: 304-305). The individual sections and bones of a right sided human foot, which includes the tarsals, metatarsals, and phalanges from proximal to distal (Image credit: Encyclopedia Britannia 2007). It is important to note here the two main arches of the human foot, the transverse arches and the medial and lateral longitudinal arches. The functional anatomy of the arches allows the foot to remain stable during the pressures and energy exertion of locomotion but also retain flexibility so that it can grip different surfaces whilst enhancing forward propulsion (Gosing et al. 2008: 309). The transverse arch is located along the cuneiforms, the cuboid bone and all of the metatarsal bases, and simply forms a domed shaped which strengthens the foot during locomotion. The medial longitudinal arch is the highest of the arches and runs along the instep of the foot, alongside the calcaneus, talus, navicular, and cuneiform bones and up to the first three metatarsals (Gosling et al. 2008: 309). The lateral longitudinal arch is lower and flatter than the media arch and runs alongside the calcaneus, the cuboid, and the fourth and fifth metatarsals (Gosling et al. 2008: 2010). The arches are supported in their skeletal frame by a complex arrangement of extrinsic and intrinsic muscles, ligaments and tendons. The sole of the foot contains numerous intrinsic muscles which mimic the muscles found in the hand, which include digitorum (flexor/abductor) and lumbrical muscles, whilst the plantar view houses the inter-osseus planar muscles (Gosling et al. 2008: 284). It is worth remembering that the majority of the larger muscles that articulate and move the foot are located in the leg itself (soleus, gastrocnemius, and the anterior/posterior tibial muscles). Although I will not discuss the soft tissues further, I highly recommend the ‘Human Anatomy Colour Atlas and Textbook’ by Gosling et al. (2008) as a key reference source. The book has a high number of quality dissection photographs and anatomical diagrams clearly highlighting the different muscle, ligament and tendon structures. The 7 tarsal bones of the foot help to form the longitudinal and transverse arches of the foot, which is often called the tarsus. The talus articulates superiorly with the distal tibia and fibula, the calcaneus forms the heel of the foot and supports the talus (White & Folkens 2005: 291). The navicular sites between the 3 cuneiforms and the head of the talus (White & Folkens 2005: 292). The 3 cuneiforms and the cuboid act as a second row of tarsal bones and articulate with the proximal heads of the 5 metatarsals. Dorsal view of the tarsal elements and proximal metatarsals (Image credit: University of Cincinnati). The talus (astragalus in animals) is the 2nd largest tarsal and sits atop of the calcaneus, between the tibia and the fibula. It is distinct in it’s saddle shape, with a head (that sides medially when viewed from above) and a body that forms the posterior portion of the bone. The largest tarsal, forming the heel bone, the calcaneus is located inferior of the talus and supports the distal portion of the foot. An intact calcaneus is extremely distinct, and can be sided by placing the ‘heel’ away from you and the articular surfaces superiorly, and the shelf (sustentaculum tali) should point the side it is from. The cuboid is located on the lateral side of the foot, between the calcaneus and the 4th and 5th metatarsals. It is distinct in appearance because of its large size with a cuboidal body. There is no articular surface on the lateral side of the bone, and the inferior surface has a pronounced cuboid tuberosity. The navicular sits snugly between the talus and the cuneiform elements, and has a distinct concave proximal surface. 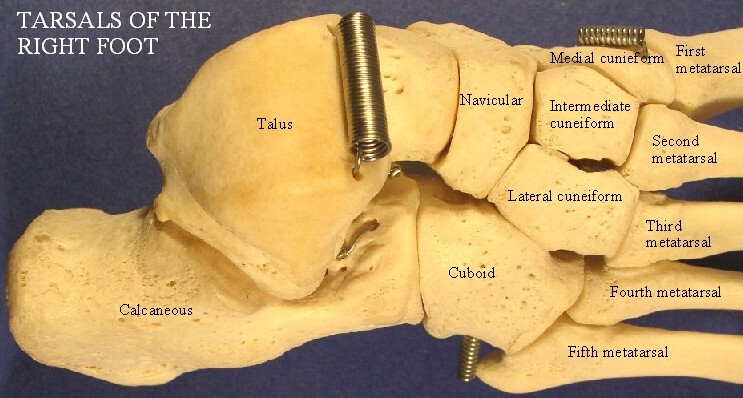 A tubercle points medially when viewed from the view of the talus. It is similar in shape to the scaphoid carpal. The medial cuneiform is the largest of the three cuneiforms, sitting between the navicular and base of the first metatarsal. It is less of a wedge shape than the other two cuneiforms, and distinguished by it’s ‘kidney-shaped facet for the base of the first metatarsal’ (White & Folkens 2005: 298). This cuneiform is the smallest of the cuneiforms and is located between navicular and the 2nd metatarsal base. It articulates on either side with the lateral and medial cuneiforms. The non-articular dorsal surface is key for siding, with a projecting surface points towards the side it comes from when the concave facet is pointed away from the holder (White & Folkens 2005: 298). Located at the centre of the foot, and intermediate in size between the intermediate and medial cuneiform, the lateral cuneiform sits at the base of the foot. It articulates distally with the 2nd, 3rd and fourth metatarsal bases, proximally with the navicular, medially with the intermediate cuneiform and laterally the cuboid (White & Folkens 2005: 299). The 5 rays of the metatarsals are typically labelled as MT 1-5, with MT1 representing the hallux, or the big toe (as the thumb is named the pollex). The metatarsals are all ‘tubular bones with rounded distal articular facets (heads) and more squarish proximal ends (bases)’ (White & Folkens 2005: 300). They are more easily sided by the morphology of their bases. It is important to note that each of the tarsals in the distal row (either of the 3 cuneiforms or the cuboid above) articulates with one or more of the metatarsal bases (White & Folkens 2005: 300). The first metatarsal is the most massive and squat, whilst all non hallucial metatarsals articulate with each other. The fifth metatarsal bears a distinctive blunt styloid process on it’s lateral side that makes it fairly identifiable. 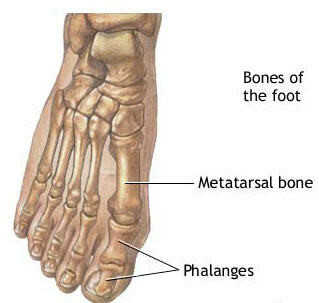 A basic dorsal view of the metatarsal and phalangeal bones in the right foot. Note that the hallux (first digit medially) has only a proximal and a distal phalanx whilst the other digits have a proximal, intermediate and distal phalanx (Source). The foot phalanges are the same in design as the hand phalanges with heads, bases and shafts but are much shorter and squatter than the hand phalanges. Again they come in three rows, with 5 proximal phalanges, 4 intermediate phalanges and 5 distal phalanges; it should be noted that the MT1 hallux has, as does the thumb (pollex), only the proximal and distal phalanges with no intermediate phalanx, and is remarkably more chunkier then either of the other four rays. Each Proximal Phalanx displays a ‘single, concave proximal facet for the metatarsal head and a spool-shaped surface distally’ (White & Folkens 2005: 306). Each Intermediate Phalanx displays a ‘double proximal articular facet for the head of the proximal phalanx’, and again have a trochlea shaped distal articular facet (White & Folkens 2005: 306). Each Distal Phalanx displays a double articular proximal facet for the head of the intermediate phalanx and a terminal tip of the bone, resulting in a non-articular pad (White & Folkens 2005: 307). These phalanges are all much shorter than their companions in the hand, with the foot phalanges having a more circular shaft cross section compared to the D shape shaft of the hand phalanges. Foot phalanges generally display a more constrictive shaft than hand phalanges, although it can be difficult to side them and it is best done with a full replica or whole specimens for comparative analysis (White & Folkens 2005: 308). A detailed map of each element and the surrounding musculature (as well as relaxing classical music!) can be found on the website of the UMFT Department of Anatomy and Embryology site. Be aware there are detailed anatomical prosection and dissection diagrams, but it is a free, fascinating and wonderful source (and with the music especially relaxing!). A number of websites have detailed diagrams and photographs of the foot from a medial/lateral and a dorsal/planar view, including this site and this one. Finally, do you know your tarsal bones? Test yourself here! Brothwell, D. R. 1981. Digging Up Bones: The Excavation, Treatment and Study of Human Skeletal Remains. Ithica: Cornell University Press. Jarmey, C. 2003. The Concise Book of Muscles. Chichester: Lotus Publishing.